There comes a time when you have to strike out on your own and start promoting your own online course platform. We can never trust a 3rd party platform (no matter how much we like them), to care about our business and income the way we do. After 15 years of building business' online I can say for sure that a third party platform WILL ALWAYS let you down in the long run. And when you build your own platform you are free to market your courses the way YOU want to and not be governed by someone elses arbitrary standards of what you can and cannot sell. This is a recent example of this, Skillshare decided that entrepreneurial courses were not welcome on the site, so if you have courses on how to an build online business, they will not be accepted. This is a thriving industry and lots of genuine top quality content used to be available, but now it is banned and the only way of legitimately earning online income, according to Skillshare, is by freelancing (no fixed boss - just multiple bosses type income). They banned Amazon FBA, Ebay Courses, Online Business Building Courses amongst many, so we are not talking here about get quick rich schemes, but business models that are now becoming the standard for entrepreneurs worldwide. Want to learn how to sell your product online through Amazon on Skillshare? Then there is the issue of competition, where you build up a course on a 3rd Party Platform like Udemy or Skillshare, do really well and then along comes someone else who has seen your success and moves in on it. Now you have a direct competitor for a small audience pool and your income will drop overnight as you now have to share your piece of the pie with the newcomer. The other issue linked to this is that a 3rd party platform will often 'pick' its winners. So you create your course, and it is a good course, but then the platform decides that your direct competitor should get all the love for that category of courses. They then create direct marketing campaigns for those courses and now you have a competitor that has been selected by the platform, who is promoted constantly, gets ranking in search because of the sales and promotion, whilst you are left scratching your head as to what you did wrong. Be Careful Of Those Revenue Figures! This is why you should be very cautious of accepting revenue figures from a third party site because they can present the income of the 'winners' they have picked as an example of the success of their platform. So you think there is huge organic income when in fact it can be heavily subsidised income for a select group of courses and instructors that the platform has marketed heavily, it is this marketing that has created the revenue you are being shown, it is not natural income from the sites pure organic activity. Don't get me wrong, there are many instructors who have made a small fortune on some of these sites and if you can find a niche, then you can also achieve short term success and is an essential first step when you are new to creating online courses, just be aware that it should only ever be short term until you find your feet. We have seen that it is not a quality issue as to who gets picked, but is often a genuine case of not what you know, but who you know. Those that have the relationship, get the inside track, it really is as simple as that a lot of the time. We have seen out of date courses promoted over completely up to date courses, lower rated courses promoted over higher rated courses and so on. So it is important to understand that each platform will pick its winners based on its own perceived values because they need to sell its service through the 'success' of a winner they have picked. This is what makes these 3rd party sites a platform and not a full blown marketplace (a true marketplace does not pick its winners, it lets the market, the customers, do it for them, it does not interject its own opinions into said marketplace). I hope, long term, that these platforms will gain enough success that they can evolve into true marketplaces, especially Udemy, which has the greatest potential, but they are just not there yet philosophically. So you can continue building on those platforms and sites like Udemy are very viable to get yourself started, but if you want the really big money, you had better hope they pick you as their winner or most likely, don't pick your main competitor. Because if one of the big established instructors notices how much money you are making, decides to make a course on your subject (all they need is to find another subject matter expert and create a course with them on Udemy - Skillshare do not permit this at the moment), then your sales can drastically reduce overnight as they flex their influence in the marketplace. 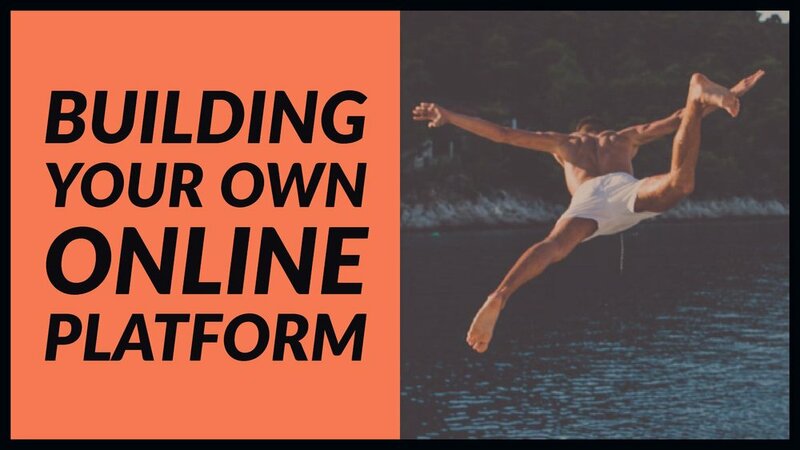 With your own site, you are competing on the internet, but the internet is a very very big place and success comes from your own marketing efforts, no matter what a 3rd party platform does or who it picks as a winner. Yes you have to do the marketing, but marketing is a skill that can be acquired, just like any other skill (nobody is born with a natural ability to build marketing funnels). So move yourself out of relying on income from the direct competitor spaces as soon as you can and start building your own empire. The best way I know to do this I have found, is to set up a Zenler school and start offering a 30 day free trial to all of your courses. Why do I recommend Zenler? Because their support is second to none, I have never had a problem or question that was not solved inside of a few hours. I can literally set up a Zenler school in a day and just link to my Zenler school from my home page on my main website, so no need to go through some massive coding exercise. And Zenler has a Free tier, where you pay commission and your Paypal fees (about 15% total) on sales - so there are no upfront costs for your business. Now you can build the site fully on Zenler if you want a brand new site, but I just like the flexibility and speed of Squarespace, it is easy to edit and has none of the security risks of Wordpress and I can change direction with my business in a moments notice. Because Squarespace deals with the backend of site support, I can just get on with web design and creating marketing funnels, I don't have to worry about a thing, that is their job. Then I just link my Zenler school to my homepage using a free subdomain, or Zenlers provided URL. So Why Not Use Wordpress? Now some folks will tell you to build your own site on Wordpress, but I would not recommend it unless you have some serious skills and know how to manage the admin side of a Wordpress site. I would also not recommend Wordpress because of the complexity of managing that type of site long term and the security vulnerabilities that hit so many wordpress site owners who just do not have the time or skills to deal with the constantly evolving security threats (this advice comes from running a website design business). Now when you have done that, create a 30 day free trial course (to do that in Zenler, create a duplicate of your main course with a 30 day expiry date on it) and share 100% free coupons from that duplicate course. Make sure your courses are sold as subscriptions, either as a masterclass or as a bundle of courses. Make sure you link your Zenler free sign ups to your email marketing provider (I use Activecampaign). So How Do I Get Students Onto My Platform? Give your students 30 days unlimited access (without a credit card sign up) and they can binge watch your courses and get incredible value. Then add new content periodically to the course and every time you do, notify the students. If their 30 days are up and they want access to the new content, then they can subscribe to the course with a discount which you offer whenever you release new content. They get free access and you get paying students from folks that really enjoy your content! Where Can I Find My First Students? When you start you just need to get a few students in so that you know everything is working. Then all you need to do is share your coupons in some Facebook coupon sharing groups and you are good to go. So the question really is, what are you waiting for?